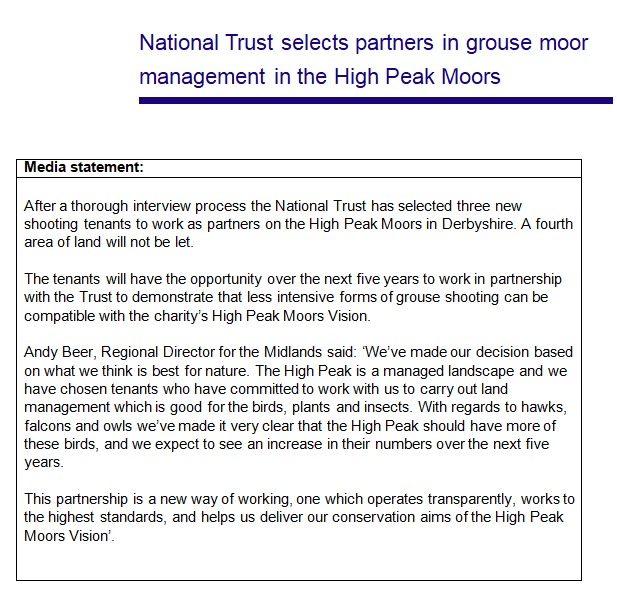 The National Trust is moving towards a new future on grouse shooting on their land in the Dark Peak of the Peak District National Park – although it’s a rather complicated one. 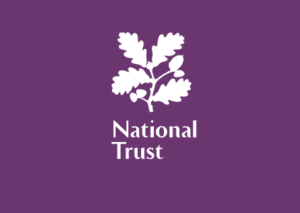 For new readers, the National Trust, a conservation charity, is parting company with its shooting tenant in the Peak District due to what might be called, were this a divorce, irreconcilable differences. And so the NT has told the world that it is looking for suitable tenants to take on this land who are also fully signed up to the NT’s High Peak Vision. Now the NT is close to agreeing terms with not one tenant but three new tenants. Contracts have not been signed but the NT tells me that this is what they are planning on the land previously managed for driven grouse shooting by their outgoing tenant . This is a complex way forward which has something for everyone and which therefore will please no-one very much. I’m grateful to the NT’s Andy Beer for talking me through some of this and I’ll be emailing him a few questions which he said he’d try to answer in writing with some thought. Some will see this as yet another example of the NT bending over backwards to keep a field ‘sport’ going on its land when it doesn’t have to do so. Others will see it as giving in to a bunch of townies who don’t know anything about the countryside. There will be a wide variety of views. My initial view is that I wish that NT (I speak as a member at the moment) had been braver on this issue. I’m not angry with them, but I’m disappointed with this complex outcome. What do you think? I think it is quite straightforward. In 5 years time count the Hawks, Falcons and Owls that are nesting in this specific area of the Peak District. In the meantime I hope that the NT do not adopt the Natural England method on being open and transparent! Both organisations, by now, must realise that they are being closely monitored by an increasing cohort of ordinary citizens who carry the right to a vote. Sadly can't see NE or NT being bothered by voting public, ample examples of their actions which have demonstrated contempt for public concerns even when presented with evidence or views expressed by volume of people? Will this rather wishy washy approach attract new members? Maybe those who know no better and want cheap car parking but not committed conservationists? NE is there as a protective wall to shield politicians, grassroots staff demoralised and NNRs being developed into commercialised country parks as they have to find ways to self fund etc.? "those who want cheap car parking" - hahaha, that just about sums up average NT membership. "What we think is best for nature" .........really? ...so will there be any surprises when the NT announces they sign up to brood medling scheme. I'd be very interested to know what the criteria are for judging the success of these tenancies - other than numbers of 'hawks, falcons and owls.' No doubt on your list of questions, Mark. What catches my eye in the press relaease is the emphasis on 'managed landscape' and 'carry out land management'. What does that mean in the context 'best for nature'? I supose it means that (a) the land is damaged in some way - by the previous tenants? (b) NT don't want to spend any of their own money on fixing it, and (c) therefore they feel obliged to offer financial returns for the new tenants, in the form of income from shooting, in order to deliver the hoped-for improvements. But why (b)? It means creating habitat diversity in the form of heather stands at a variety of different ages that benefit /sustain wild grouse and a host of other associated moorland specialist species. Without the shooting revenues, there's no insentive to mow/burn and ultimately protect /sustain the one vital link for the moorland ecology - heather. This management can work on 30 year cycles like hazel coppices. Even as a compromise, I'd have preferred no driven Grouse shooting at all. The test will be whether any raptors are 'disappeared' over any of these areas in the next five years (a cynic might say it is a good way to put off the issue for another five years - which is when the trail hunting thing can be debated again, I believe) or whether other predators are thriving or not and whether water runoff and biodiversity is an issue or not. But looking at a map, it seems to me that the Kinder Plateau (no shooting) will be surrounded on three sides by shooting of one sort or another, and any raptors based there will likely access or disperse to these dangerous areas. (*) I couldn't find the area known as Park Hall, even on the NT website! That hardly makes for a rigorous comparative study! Someone please tell me I am wrong on that. Keith - you're not wrong, you're right. The only Park Hall I can find via my OS map of the area is to the west of Kinder Reservoir, near to Little Hayfield. I wish they had been braver but it is an advance, perhaps near what we might have realistically hoped for. Paul is right: we should know what counts as success. This is, after all, quite an important experiment and we don't want HOT- type goal shifting. By contrast Andy Beer is honest but let's try to get him to articulate success criteria at the outset for public (and NT members') review. Of course that includes all sorts of stuff such as burning, drainage, etc, as well as wildlife crime. You can't do this without that. Do we know what 'a consortium of GWCT members' means. Does it mean that GWTC have skin in this game? If so that is interesting but again we don't want a HOT situation. I hope that a direct outcome will be that that it becomes exceedingly unlikely that a raptor will die by human agency or 'disappear' on this land. But what if.... Worth asking the NT, worth asking the GWCT, worth aking others. Whatever the outcome(s) from this mixed bag, they will realise that they are under the microscope and if/when there is evidence of wildlife crime then they will be judged on their reaction to it (again)? If there are no measurable improvements for wildlife delivered by management for shooting, most especially DGS then what will the NT do? Is there some clause in the agreement? So, an inch or so forward and whilst the MSM will peddle the virtue of voluntary and guidelines etc. social media is powerful particularly when offering facts not fiction from spin their bowlers? If the 'consortium' are credible and law abiding why would they not be proud to promote their adherence to legal activity and condemn illegal criminal activity? I think this will be an interesting area to follow. The High Peak vision is a good one and is the reason that the previous tenant was ousted. So there will be driven grouse shooting managed by a ‘conservation’ organisation, what seem to my ‘townie’ eyes to be two ‘walk-up’ shoots and a fourth area which I presume will be managed in-hand by NT. There is an opportunity to design some very robust monitoring of vegetation, breeding birds, butterflies and other groups going on here which will allow for comparisons between the four areas over time. I’d like to know if predator control (as in legal control of corvids, foxes etc) is to be carried out. Will burning be allowed? Will there be attempts on the shooting land to restore degraded bog and to allow other features such as trees and scrub to return? I envisage both extremes of the argument will be disappointed but is there an opportunity for a good middle ground to be found here? One which is transparent and scientifically robust. Maybe the question of ‘Can grouse shooting and nature conservation co-exist or even thrive together’ is to be answered. Quite simply, there'll still be no Hen Harriers. What the hell does a a consortium of GWCT members mean? Most of the bad guys in grouse shooting are members, including I believe the recently rejected tenant, so in reality this should hardly be reassuring. It is obviously meant to be but excuse me whilst I remain very very cynical. It also depends on the length of these tenancies, will we see in 5 or 10 years NT rethinking this? I'd like that very much, but much sooner. The first thing that strikes me is that when something 'goes wrong', i.e. wildlife crime, each of the shoots can say 'It weren't us, Gov, it were them...' so no matter where the 'corpse' is found, there will be the usual 'can't prove anything, carry on as usual'! Imagine if in the detail in the contract, there was a clause that went along the lines of ‘if there is raptors shot or poisoned on any of the NT land or any of the adjoining Estates then the shooting leases will be immediately terminated’. This could have interesting ramifications especially as the GWCT are involved. My instant reaction was that this was not the worst outcome. Obviously not the complete cessation of grouse shooting that we hoped for, but equally, driven grouse shooting will cease on 3/4 of the land. Mark's campaigns have been to ban *driven* grouse shooting, as the worst environmentally-damaging practices seem to be less strongly associated with walked-up shooting. Therefore, a real test will be whether raptors return, and damaging practices like heather burning stop, on the two walked-up shoots, or whether these are still markedly 'worse' than the four, shooting-free, parcel of land. It would also be interesting to know (though I don't expect we ever will!) how closely the NT will monitor gamekeeping practices on the driven shoot: if they take responsibility for ensuring good (and legal) practices, could we see something like Langholm occurring, where raptors are allowed to return even at the expense of the 'shootable surplus'? Fingers crossed! On the other hand, as Mark says, this is quite a complex response to a single reported raptor-persecution crime (albeit where there is one, we assume there are many!). The NT's simplest option would have been to evict the current tenant, appoint a direct replacement and release a statement to the effect of "the new tenant understands that we don't want any raptor persecution". To me, it seems to suggest that the NT would like to move away from DGS but still feel pressure from pro-DGS lobbyists. Therefore, if evidence of continuing raptor persecution comes to light on the driven shoot (or even either of the walked shoots), would that be the final nail in the coffin for grouse shooting on NT land? My NT membership was up for renewal shortly after the trail hunting vote, and I allowed it to lapse, pending the announcement of whatever decision was reached on this land. I feel cautiously positive this morning and am now considering re-joining. Moorland Vision achieved 7500 signatures to its petition imploring the NT to do something radical and exciting for nature conservation on this huge estate. The NT has failed to do anything remotely 'radical' but given way to its shooting /GWCT friends and ended up with an utter mismash, even clearly condoning driven grouse shooting as an 'acceptable' form of upland management by allowing it to continue on part of the estate when we all know it isn't and can never be such. How can they possibly say 'We've made our decision based on what we think is best for nature'? And why did they exclude harriers (and kites) from their list of raptors? Was that accident, ineptitude or deliberate? And when they say it will be good for 'birds, plants and insects' I note they (deliberately?) miss out mammals. So we can expect a continuation of the shooting and snaring of everything on four legs, trapping which occasionally kills ring ouzels and other non-target species and the slaughter of mountain hares (which already appear to have 'disappeared' from one area of the National Park judging by the 2017 Sorby group's survey). The NT is rarely 'transparent' and I very much doubt it will be during the next five years about what happens on this estate. Clearly it has paid no attention to the 7500 who took the time to sign Moorland Vision's petition, effectively throwing it back in their faces by allowing some DGS to continue. This statement smacks of a lack of basis bird and upland ecological understanding and confirms nature conservation and a concern for proper ecological management of its land comes way way down on the NT's list of priorities. How can anyone who signed Mark's petition in any way applaud this outcome, accompanied as it is by such a poorly worded statement smacking either of clever omissions or a lack of basic ecological knowledge or both? More detail is needed here. The area of Hope Woodlands to the north of A57 is probably 4000 hectares and extends to the Upper Derwent. Is all this area now going to be a low key walked up shoot? This patch adjoins the NT Howden moors of around 2500 hectares which are let to a DGS tenant. It's no secret that the more remote parts here are where Hen Harriers try and fail to nest. Reading between the lines, shooting tenants helping with management sounds like gamekeeping - will the same gamekeepers investigated for the Harrier Decoy continue to work over Ashop Moor and the rest of Hope Woodlands? If this is the case there is no chance for raptors. I helped Nick Moyes with the No Moor Shooting petition and over 6000 people signed with the overriding aim of stopping damaging "management". Andy Beer agreed with everything I said when we handed over the petition. But I was just part of a slick PR exercise. As long as this plan looks good on paper, that's all that matters. There will be plenty of excuses available when the numbers don't add up. It's a bit like Monsanto introducing a little line in organic fertilizers. as I spit the lead shot out. For those wanting the trust to " send a message", with a complete ban, there will be disappointment, at least for now. That option is still on the table for the future, I assume. For the present I think this project, for want of a better word, if rigorously managed has potentially another message, certainly for landowners such as the utility companies ( who could have acted more forcefully a long time ago), and their sporting tenants. Not forgetting of course,the trust's adjoining properties. including rent, to be adjusted accordingly. I suspect this could be one of the reasons for the break up of the previous package. It would be informative, at this point, to see the management plan and agreements , respecting confidentiality of course. Whatever the hoped for outcome in all this, the actions of surrounding landowners ,and tenants, will play a vital role. The Snake, unlike Langholm is not an island. Apparently, Moorland Vision believe there was no previous shooting on the Black Snake - north of the A57, so there might be no overall gain in shooting-free areas in the National Trust's land ownership after all (and that is despite the fact that raptors will not stick to gun-free areas anyway). Are the National Trust trying to present this proposal as some well-designed controlled experiment on the effects of varying moorland management techniques? It might look to be to the uninitiated (politicians - in which case it could be a trick) but it isn't - important variables are not properly separated. Or do the National Trust accept it is a bit of a fudge and that any 'results' are likely to be muddied? Isn't it time we had some vertebrates in charge? I would have liked to see one of the wildlife trust proposals given a chance on a reasonable sized area to see if all the claims of a wildlife paradise came through or are just pie in the sky . Not sure how this will work with the different zones and not sure about the distinction between walked up and over dogs shooting but it will be interesting . Comes over as a bit of a mess . Keith, the Back Snake has always been shot, if somewhat lightly. The wet, grassy nature ,as with much of the North side of the A57, along with Featherbed Top, has precluded it from the more intensive management regimes. The National Trust have possibly also found it easier to get the preferred tenants by concentrating the lease on the best ground. What intrigues me is the difference between the lease for Back Snake, as a walked up moor, and Park Hall, to be shot over dogs. It will be interesting to see what levels of management are permitted, and therefore reflected in the price of the lease. I would expect both moors, at times, especially Park Hall, to benefit from the work of their neighbours. Never a good thing without something in return. David, there are already quite large areas of the peak- Eastern Moors, and the southwest-, under conservation led initiatives, not to mention much moorland effectively unshot , rarely burned, and with grazing reduced. I reserve judgement on these areas, although the RSPB at their Dove stone reserve in the northwest has had excellent results with declining waders. The only experiece I have is here in the West of Scotland where hill farming is the dominant land management . So far over the last 25 years removal of livestock on several areas seems to lead to a crash in the wader population and an icrease in native scrub woodland and bracken . Areas used to graze hill cattle and with some burning seem to be the best for wildlife . We used to call it farming but these days conservation grazing is the buzzword . Dr David Bellamy wrote of his support of the uplands managed landscape for grouse shooting "although I'd never join them in the shooting butts" - on grounds of the specific biodiversity these regimes protect and maintain. To understand this requires something of an understanding of the ecology of these environments, which, are unique to the British Isles - having some 90% of the world's heather moorland. Grouse are still wild game birds and rather than farmed, maintaining conditions for grouse benefits a range of other moorland specialists at the same time. The principles of "arrested succession" apply i.e. the artificial maintenance or preventing of habitats changing/degrading in diversity through continued management. Heather unmanaged over a long period collapses in on itself and becomes more open an gappy. Populations of grouse and other species are seen to suffer. To prevent this good management seeks to maintain a succession of heather blocks at different ages - young seedling - open enough for chicks to forage for insects before they can digest actual heather. Young vigorous plants for food/growing tips and older dense stands for nest sites and winter cover. This is achieved by successional mowing or burning, and the diversity is also good for insect numbers, small mammals and other moorland specialists - short eared owls, ring ouzals, curlew, snipe, adders, lizards. If these habitats were not managed like this for shooting revenues, the alternative is usually sheep farming which ultimately destroys heather over time and the resulting white grass landscape are not as species rich. Suspect the 'relaxed' intensity tennants relates to how zealously grouse numbers are maintained I e. Management is one thing, keepering another - so obsessive tennants might stop anything that might risk grouse or chicks being and so control ( shoot/poison) any threats. To this list is Corvids (crows, ravens) (prevented from nesting - egg/chick raiders) - foxes - controlled ( not eradicated - not possible) and - at the extreme end the owls/hawks that NT want to encourage. Sounds more like they are trying to get the balance right between the favourable landuse and biodiversity - with benign tennants benefitted a diversity from good management of land, which seens lost on this article/comments. Grouse are not "wild game" they are wild birds, and as such are protected under the Wildlife and Countryside act 1981, since the abolition of the game license in 2007 there is no longer property in "game." Our Peak District National Park was designated to the people as a "national Park," we are the landowners for goodness sake. The NT are not "landowners" they are "landholders," there is a difference. I have written to the NT in the peak district for a signed copy of the shooting leases and conditions to shoot on our designated land, result, no reply. If we the people "National" do not agree in writing to accept these alleged illegal leases, then there can be no legal contract. Armed trespass? Grouse are not "wild game," they are wild birds since the abolition of the game license in 2007. Wild birds are protected under the 1981 Wildlife and Countryside act. The NT are not landowners, they are landholders, there is a difference. These National Parks moorlands were designated to the public by the then Labour government in 1951 for our recreation and enjoyment. There was never a mention of grouse shooting. These armed trespassers should not be operating on the peoples land. I have written to the peak District NT manager for a copy of the signed shooting lease and conditions applied. I have hit the proverbial "buffer," Nothing!! !